December 2012 will see the final visit to Glede Wood by the Small Woods Association’s (SWA) social forestry project ‘Branch Out’. 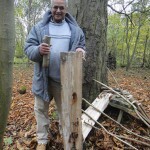 Participants of ‘Branch Out’ have been successfully visiting Glede Wood since June 2011 but our association with woodlands.co.uk’s Glede Wood has been ongoing for 6 years. 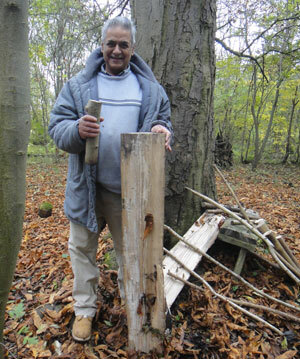 Small Woods was first offered use of the wood to help train NEETs, youths “not in education, employment or training”, helping them to learn new skills, to work as a team and to then progress to further training or employment. Our ‘Branch Out’ project has been funded by the Lankelly Chase Foundation and is a partnership project between the South Staffordshire and Shropshire Healthcare NHS Foundation Trust, Mental Health Unit and the Small Woods Association. 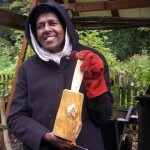 ‘Branch Out’ aims to reduce social isolation and improve the health and wellbeing of adults from black and minority ethnic groups (BME) living across Telford and Shropshire. 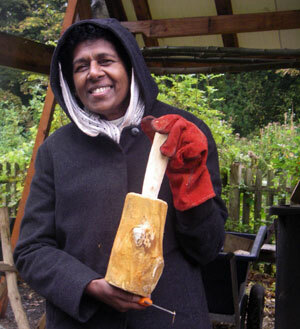 The project was originally developed to target young people from the BME community but through the referrals system with the NHS it has mainly attracted a much older group, pensioners who need to improve their physical and mental health, get out of their homes and do something different. We also have a carer who brings his father so that they can both experience a change of scenery, fashion something out of the tree branches and socialise. For over a year and a half, throughout the changing seasons and inclement weather participants have been picked up from locations around Telford and taken to Glede Wood one day a week. The health improvements begin with a walk along the track into the wood - carrying all the tools and equipment, and then collecting wood to get a fire going so they can put the kettle on. Experienced woodsman, Rob Marshall, discusses with group members what they would like to do. 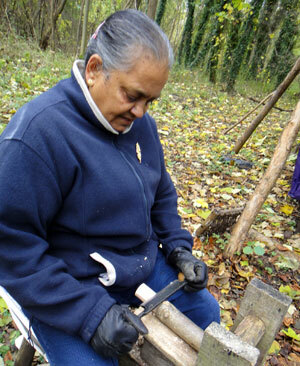 Sessions can vary between structured training in woodland management and making green wood products. 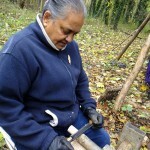 Sometimes the participants will just go for a walk and see what is growing in the wood. Some of the participants are now well on the way to gaining a Level One Open College Network accredited qualification in coppice products. The NHS Health Development Worker is working towards her OCN qualification too. Rob Marshall works with the group and is guided by their enthusiasm and their individual abilities. 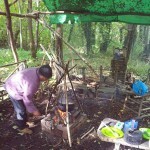 The fire is the social hub providing an opportunity to share news, life experiences and food. 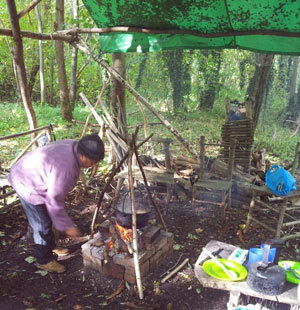 In the calming environment of the woodland, an arena for social chat is an important element of the work to break the cycle of isolation and begin to improve well-being. In regular feedback from participants they openly claim to feel many benefits from attending the project. All agree that they can relax in the woodland and most suggest that whilst learning a new skill they are beginning to regain their confidence, feel good about themselves, learn teamwork and interaction skills as well as enhancing their individual strength and resilience. 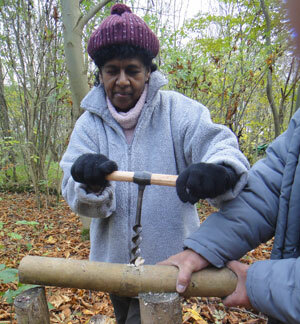 Recently BBC Radio 4 came to Glede Wood to visit the ‘Branch Out’ participants, and to find out about the project, in preparation for a series of broadcasts about trees. The first programme, which interviews the participants ‘The secret Power of Trees’ was transmitted on Saturday 8th December at 10.30 a.m.
Glede Wood is to be sold so we will be moving to a new woodland in the area until March 2013, when our funding ends; but we have been grateful for woodlands.co.uk’s support for our social forestry projects over the years and we hope to be able work in one of their woodlands again in the future. Social Forestry in Glede Wood.